Maria Ioudenitch was born in Balashov, Russia. She began studying the violin at the age of 3 with Gregory Sandomirsky, Associate Concertmaster Emeritus of the Kansas City Symphony, and has studied with Ben Sayevich at the International Center for Music at Park University in Parkville, Missouri since the age of seven. Recent engagements include performances with the Mariinsky Symphony Orchestra, the National Orchestra of Uzbekistan, the Signature Symphony at TCC, and the Mississippi Symphony Orchestra. Ms. Ioudenitch has participated in various summer festivals and academies such as the International Summer Academy at Universitat Mozarteum in Salzburg, Austria, the International Lake Como Summer Piano School (as a chamber music collaborator) in Lake Como, Italy, and the International Music Academy in the Principality of Liechtenstein. 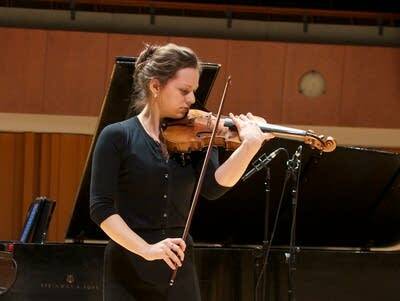 The daughter of Tatiana and Stanislav Ioudenitch, Maria is currently continuing her studies at the Curtis Institute of Music with Shmuel Ashkenasi and Pamela Frank. Maria Ioudenitch is accompanied by pianist Ying Li.